We asked local design professionals to share their opinions on ceiling medallions. These decorative moldings have been gracing ceilings for hundreds of years, but are they still a widely used design element? Here's what the professionals had to say. “I believe a ceiling medallion will always be a classic in the traditional home because it adds a touch of formality to the room. However, I don't believe that a ceiling medallion will ever be a classic in a contemporary home because it takes away from the clean, uncluttered lines of the space.” Tom Manche, Tom Manche Interiors. “Classic! Since ceiling medallions have been an ornamental item for the home since the 19th century, they are not about to go away any time soon! They add architectural interest and decorative detail to the ceiling, which is sometimes overlooked, and enhance the light fixture installed below it. With an array or materials and styles from which to choose, ceiling medallions are at home within the traditional as well as contemporary home setting.” M. Joyce Mathis, MJM Design Company. “In a large ceiling, you almost need something to draw your eye in from the large vast space. However, ceiling medallions can look dated in white. If they are finished in the same finish as the light itself, it will feel like an extension of the light and architecturally dimensional.” Nettie White, Nettie White Interiors/The Porch. “Ceiling medallions first became popular for decoration in the 19th century. Ceiling medallions are a great way to draw the eye to a stunning chandelier, ceiling fan or other ceiling fixture. Mixing ceiling medallions with modern lights creates a stunning look. Today's artisans are crafting a wide range of styles well beyond the traditional styles most people expect. While always a classic, the ceiling medallion is once again fashionable in modern-day home design.” Gigi Lombrano, Gigi Lombrano Interiors. “Ceiling medallions are classic! They were first seen in middle and upper class homes in the 19th century. Today it is very common to see ceiling medallions used in many applications. The trend seems to be moving away from the traditional white finish to more exocentric faux finishes. We are using them as a focal point to enhance a space. In some homes, we adore the medallions with a large hanging tassel instead of a chandelier. 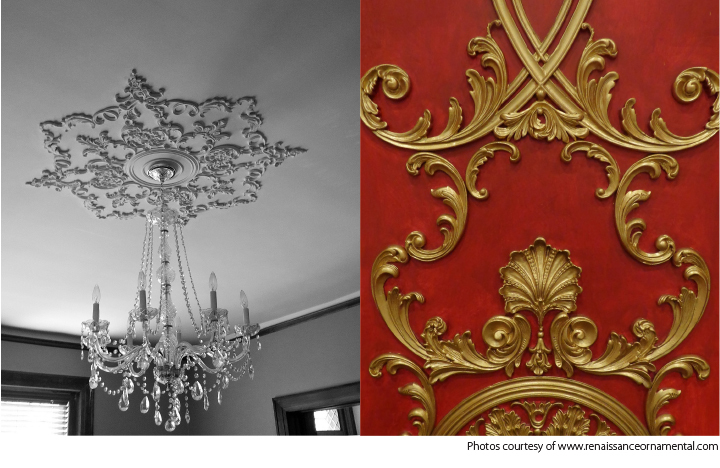 Whether you want to enhance a light fixture or create a dramatic ceiling finish, medallions will never go out of style.” Sandra Harms, House in Style.